Everything is Delicious... Especially the Margaritas! When in Charleston, be sure to visit Folly Beach, the Edge of America! One of the absolute best places to eat, drink and enjoy the ocean breezes is Rita's! 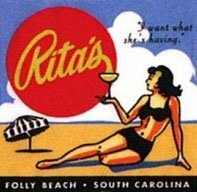 Rita's is at the end of Center St on Folly Beach, just before you run into the ocean! Check it out! Everything is good and the place is fun!